This article was published by ComputorEdge , issue #2642, 2008-10-17 , as a feature article, in both their PDF edition (on pages 18-25) and their website. When amateur musicians consider making their own electronic music, they oftentimes envision sophisticated and pricey synthesizers, electronic keyboards, and other MIDI devices, all plugged into a powerful computer (or two). They may also assume that considerable expertise is needed for creating the music on these electronic instruments, bringing it all together on the computer, possibly adding percussion from a drum machine or software application, and then mixing everything skillfully. However, there are alternative approaches that require far less investment in hardware, software, and knowledge. These include innumerable music making programs available for Windows, Mac, and Linux. Some such programs are even cross-platform, which allows you to transition your learning and compositions from one operating system to another when, for instance, replacing Windows Vista with Ubuntu, to pick a completely random example. While most of these music programs can accept a variety of input sources — digital music from MIDI devices, analog music from microphones, audio fragments from music CDs — probably the simplest source of building blocks for your compositions are the pieces of music known as "loops". These are usually just a few seconds long, and are termed loops because the music programs allow you to easily repeat the particular sound again and again, i.e., looping. You can then add drumbeats, symbol crashes, and much more, creating a complete piece of electronic music. 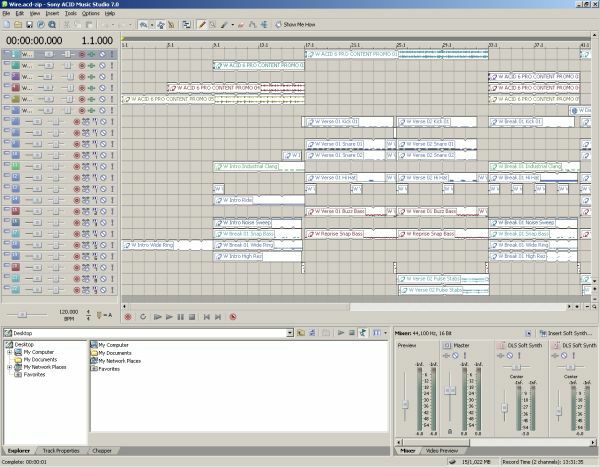 This type of loop-based music making was pursued by relatively few music enthusiasts during the 1980s and 1990s, with the ongoing proliferation of PCs. But it wasn't until 1998 that the field received a huge boost, with the introduction of ACID — the computer program, not the recreational narcotic. Originally developed by Sonic Foundry, ACID took the amateur music making field by storm, and quickly became a favorite. People were downloading and swapping thousands of free loops, sampled from commercially recorded or homebrew guitar riffs, bass lines, special effects, etc. These loops were then combined to form some incredibly imaginative compositions, which were then saved as MP3 files and distributed to fellow "loopers". 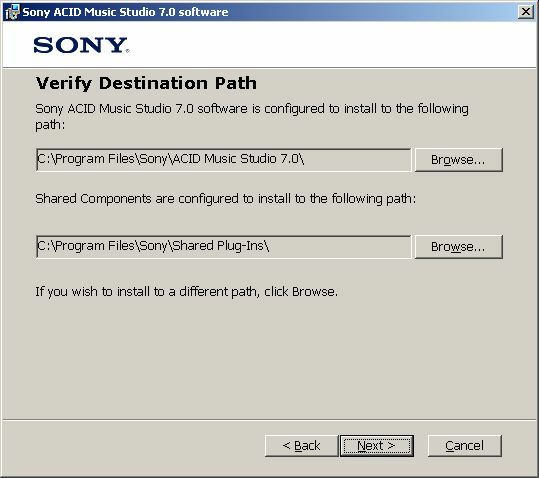 Since its inception, ACID development and distribution have been taken over by Sony Creative Software, and the application is one of three members within the ACID product family, comprising ACID Pro, ACID Music Studio, and American Idol Extreme Music Creator. In this article, I will focus on ACID Music Studio, because it is less complicated and expensive than ACID Pro (with a list price of $54.95). I will be looking at the latest version as of this writing, 7.0a. ACID Music Studio retains the functionality that made its first incarnation so popular, and has been extended to do even more, as it has kept pace with the evolution of electronic music and its use on the Web. It allows you to easily and quickly create a new song consisting of loops laid out on multiple tracks, remix tracks, and produce music for videos, websites, and Adobe Flash animations. Even though ACID Music Studio is not free or open source software, it is not expensive, and you can try it for 30 days at no charge. 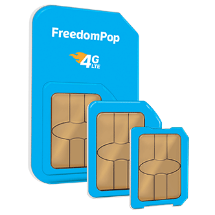 Let's examine the installation process, step by step, and then see what the program itself looks like. If you would like to try ACID Music Studio, begin by downloading the trial version. When you run the downloaded installation file, it will prompt you for a setup location. The dialog box does not make it clear, but the folder need only be a temporary one, in which the installation files are to be unpacked, and is not the final target folder for the program. After you accept or modify the installation setup folder, your software firewall checking outbound traffic — assuming that your PC has one installed and running — will detect that the installation program is trying to connect to crl.verisign.com. Declining the connection does not prevent installation. You then see a welcome dialog, followed by a license dialog. 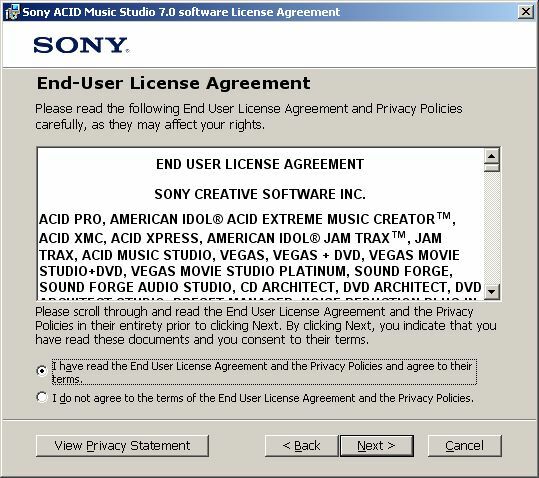 You must click on the radio button indicating your agreement with Sony's EULA, in order to proceed. You can specify the folders where the ACID Music Studio and its plugins will be installed, or accept the default values, which should work for everyone. The installation wizard is now ready to copy the program files to the target folder. 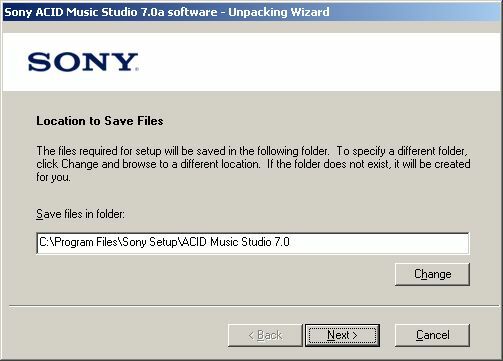 An entry for ACID Music Studio will be added to your Windows's Programs folder. Hence, if you want to minimize the clutter of icons on your desktop, and have no interest in adding the program to your Start menu, then do not bother clicking the checkbox for installing a shortcut on your desktop. Again, it tries to connect to crl.verisign.com (persistent, isn't it?). As before, declining the connection does not cause any problems. Like far too many applications nowadays, the installation wizard tells you that you have to reboot your PC for the configuration changes to take effect, but there appears to be no need to do so. When you run the program for the first time, you are required to register it. You can enter in any values that you wish, because it does not send a verification email message to the address you provide. It tries to connect to mediasoftwareapps.com, which I allowed, without any problem. Assuming that the program was able to connect to the registration server, you will first be presented with a dialog box with links to helpful information: how to work with projects (create events on the timeline, extract a file from a CD, record audio, publish your project online, etc. ), edit events (fade audio in and out, pitch shift an event, split an event, etc. ), edit tracks (duplicating, using audio envelopes, etc. ), and work with MIDI input (set up a MIDI device, record a MIDI track, etc.). You can always return to these tutorials later. 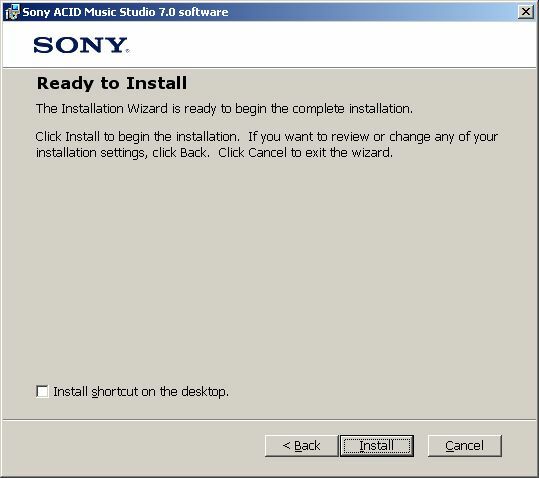 The user interface may look intimidating at first, but that is mostly because the program by default loads a sample project, Wire.acd-zip, which comprises many tracks. Rather than immediately closing this project, it would be well worth your time to examine it in detail, and experiment by making changes to it. Yet before doing so, first take a close look at the various parts of the interface, starting with the menu bar and toolbar at the very top of the window. Below the menu and tool bars, on the left side of the window, you will find the track list for the current project. In Figure 7 below, are tracks 6 through 11. Each one of those tracks consists of the loops that are laid out in the timeline immediately to the right of the tracks. In Figure 8 are the loops that have been added to those half-dozen tracks, starting at the time piont 33.1 seconds and continuing to 57.1 seconds. 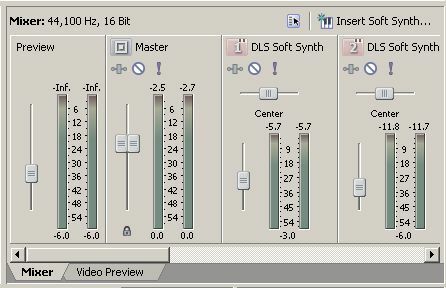 The lower right-hand portion of the window contains the mixer controls. Initially, you probably will not do any mixing, but instead focus on developing new compositions. To learn more about how to use the ACID Music Studio program, consult the Help menu, where you will find "Contents and Index" as well as "Show Me How", which contains the 26 tutorials seen earlier during program startup. If you begin enjoying the process of making your own music — using nothing more than your PC, this program, and loops — as enjoyable as most music lovers do, then you will most likely want to find more loops to use within your compositions. The program itself comes with over 3000 ready-to-use loops, from such music categories as rock, hip hop, orchestral, and of course electronica. For some people, this may be more than sufficient. But if you would like to obtain even more loops, check out the Sony Sound Series Loops & Samples collection, which offers thousands of loops, organized by genre. Also be sure to visit ACIDplanet.com, which has additional tools, music created by a wide variety of artists, music contests, podcasts, videos, forums, personal account management, Internet radio, help information, and a top-10 list — which may someday be graced by one of your own ACID compositions.